In China circa 1906, a British anthropologist discovers a frozen prehistoric creature and must transport it to Europe by train. 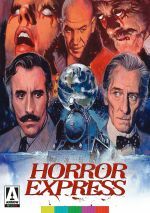 As a team, fans mainly know Peter Cushing and Christopher Lee for their many Hammer Dracula movies. The pair go for a different kind of terror with 1972’s Horror Express. Set in China circa 1906, British anthropologist Sir Alexander Saxton (Lee) discovers a frozen creature he thinks might represent the “missing link” in the evolutionary chain. Excited about this, Saxton decides to transport the humanoid popsicle to Europe on the Trans-Siberian Express. This doesn’t go well, as it turns out the creature never died. When defrosted, the entity manages to go on a killing spree, one that also allows it to use passengers as “hosts” for its consciousness. Along with Dr. Wells (Cushing), Saxton attempts to halt this slaughter. Any movie that dabbles in killings on a train will inevitably draw comparisons to Agatha Christie’s Murder on the Orient Express, and those links clearly occur. Unquestionably, the filmmaker realized this and played with expectations in a fun manner. Essentially Orient blended with The Thing, Express provides a surprisingly entertaining horror tale. I admit I went into it with fairly low expectations, as I thought the film offered a potentially enticing premise but it felt likely to suffer from overwhelming levels of cheesiness. And Express can lead toward camp at times. Those traits become almost inevitable given the movie’s story and the era of its creation. Despite the ways it veers toward silliness, Express brings us a pretty taut horror experience. It embraces the insanity of its story and occasionally threatens to wink at the audience, but it avoids self-parody just enough to deliver excitement. To be sure, Express does play fast and loose with genre tropes. It toys with our expectations as both horror and suspense, and it manages to bring out a lively tale in both domains. All that and a larger-than-life turn by Telly Savalas as a Cossack officer! Express occasionally threatens to derail but the movie usually remains clever and fun. Horror Express appears in an aspect ratio of approximately 1.66:1 on this Blu-ray Disc. Though dated, the image appeared generally adequate. I saw no examples of moiré effects or jagged edges, and the presentation seemed to lack evidence of edge haloes. Source flaws also failed to create any distractions, and grain remained natural, without signs of digital noise reduction. Colors came across as fairly full. The movie opted for a reasonably natural palette that could look a little messy at times but largely appeared pretty dynamic. Black levels usually stayed fairly deep and dense, while shadow detail showed positive consistency. Ultimately, Express provided an acceptable visual presentation given the nature of the source. As for the LPCM monaural soundtrack of Express, it was perfectly adequate for its era but not much better than that. Speech sounded intelligible and clear, though the lines suffered from an awful lot of mediocre looping. The effects represented the source elements in a competent manner. These elements offered reasonable accuracy without great punch. All of this was good enough for an age-adjusted “C+“ that lost most of its points due to all the iffy dubbing. We get a decent array of extras, and we begin with an audio commentary from historians Stephen Jones and Kim Newman. Both sit together for this running, screen-specific look at cast/crew and aspects of the film’s production. While we find a reasonable look at the movie itself, much of this track feels more like an appreciation than anything else. That works fairly well but I wish the commentary delivered more concrete info about the flick. This becomes a moderately engaging piece but not a great chat. We can view the film with or without an introduction by horror journalist Chris Alexander. In this six-minute, 50-second reel, Alexander discusses his personal experience with the movie and some aspects of its production. The manic Alexander needs to switch to decaf, but he manages to lead us into the movie in a competent manner. A few featurettes follow, and Ticket to Die runs eight minutes, 31 seconds and provides notes from filmmaker/historian Steve Haberman. He discusses aspects of the production and his opinion of it. Billed as an “appreciation”, Haberman musters more than basic praise. He offers a decent overview of different movie-related elements and makes this a worthwhile reel. With Night Train to Nowhere, we find a 15-minute, eight-second piece with filmmaker Ted Newsom as he tells us about producer Bernard Gordon and some aspects of the production. Like Haberman, Newsom brings a good array of insights related to the movie and its participants. Murder on the Trans-Siberian Express spans 14 minutes, three seconds and brings an archival interview with director Eugenio “Gene” Martin. He talks about the movie’s path to the screen and aspects of the shoot. Next comes Notes from the Blacklist, a 30-minute, 30-second program with producer Bernard Gordon. Recorded in 2005, Gordon relates thoughts about his career and the impact of the Hollywood Blacklist. Gordon proves blunt and informative. Finally, Telly and Me goes for eight minutes, nine seconds and features composer John Cacavas. He looks at aspects of his film career and his work on Express. This winds up as a reasonably engaging little chat. In addition to the film’s trailer, we finish with a booklet. It gives us art, credits and essays from Adam Scovell and Mike Hodges. It completes the set in a satisfying manner. A nutty melange of genres, Horror Express brings us a pretty delightful affair. A fun mix of scares and thrills, the film offers a brisk, exciting tale. The Blu-ray offers generally positive picture and audio along with a fairly informative array of bonus materials. Express surpasses expectations.